PerryGolf is proud to partner with Azamara Club Cruises for an exceptional 12 night, 5 round golf voyage nearly circumnavigating the Emerald Isle onboard the outstanding 690 guest Azamara Quest. 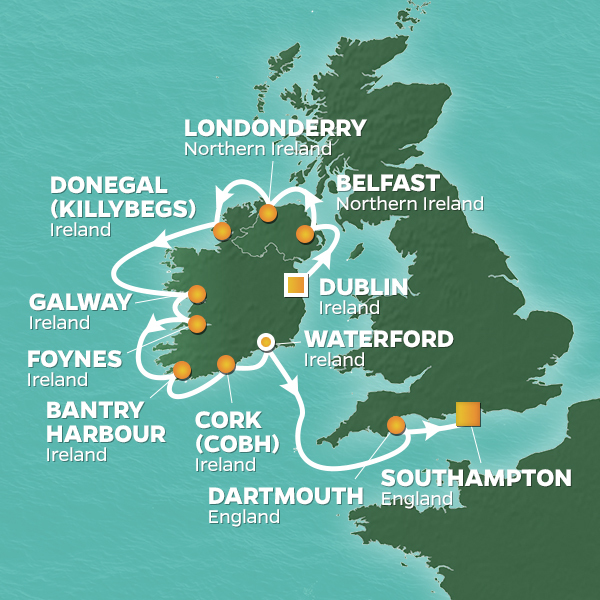 We sail from Dublin for nine diverse ports including Belfast, Londonderry, Donegal, Galway, Foynes, Bantry, Cork, Waterford, and finally, Southampton. The golf is exceptional with five of Ireland’s highest rated clubs including Royal County Down, Royal Portrush, Ballybunion Old and remarkable Old Head. ... Read More. The guest list will number between 40 and 60, most of whom are golf couples although it’s common to have non-golfers who will enjoy themselves as a luxury cruise guest starting with Quest’s fabulous facilities along with a wide selection of Azamara Shore Excursions®. The “2020 Irish Links Golf Cruise” is a full-featured vacation and a unique opportunity to enjoy a yourself in the company of like-minded new friends! Fortunately, this is one of our longest port visits because there is a lot to do in Dublin. A good place to begin is The National Museum of Ireland on Kildare Street for a well-designed archaeological collection featuring Bronze Age gold jewelry and Viking swords. The stars of the show are the “bog people” — preserved corpses of men who were killed (presumably sacrificed) and tossed into peat bogs during the Iron Age. The preservative qualities are remarkable. Dublin is home to St Patrick’s Cathedral of course but much of Ireland’s history can be read in Christ Church Cathedral, which dates back to circa 1030. The medieval crypt is full of treasures plus the belfry tour (11:30 a.m. and 1:15 p.m.) provides a beautiful view and an up-close look at the flying buttresses, as well as the chance to try bell-ringing. Dublin’s booming culinary scene is found along Exchequer Street where The Green Hen has won many admirers with its combination of French atmosphere and Franco-Irish cuisine made with locally sourced ingredients. Try the pan-fried duck breast. Finally, while craft beer is certainly the popular new thing, a pint of “the black stuff” is still required drinking on any trip to Dublin. The Guinness Storehouse museum at the St. James’s Gate brewery explains how the stout is made and how to pull a proper pint at the correct 45-degree angle and waiting 119.5 seconds before topping it off. Take it up to the Gravity Bar, where the 360-degree view of Dublin is worth lingering over. Enjoy Dublin on your own or via Azamara Shore Excursions®. Today play Portmarnock Links designed by Bernhard Langer and opened for play in 1995. As a three-time winner of the Irish Open at nearby Portmarnock Golf Club and The Royal Dublin Golf Club it was fitting that Langer chose this magnificent setting to design his first links course set in the grounds of the old Jameson Estate of St. Marnocks. The course has played host to professional and amateur events including 2008 and 2009 Ladies Irish Open. Note: Golf cart venue. GOLF: Today play Royal County Down. Located in the town of Newcastle to the south of Belfast. Consistently ranked in the top 10 courses in the world, this is a true test of links golf set against the magnificent backdrop of the Mountains of Mourne. Host to the 2007 Walker Cup Match featuring a young local by the name of Rory McIlroy, and an all-star USA lineup. Enjoy Belfast on your own or via Azamara Shore Excursions®. GOLF: Today play Royal Portrush. It holds the distinction of being the only course in Ireland to have hosted The Open. Royal Portrush returned to The Open rota in 2019 following a 70-year absence. The Dunluce Course is as fine a links as you will find anywhere, with the 5th being a particularly memorable hole to a green hanging on the edge of a cliff. Consistently ranked in the top 20 of the world's best courses. Enjoy Londonderry on your own or via Azamara Shore Excursions®. Described by National Geographic Traveler as the “Coolest Place on the Planet for 2017,” Donegal is a nature lover’s paradise, located at the mouth of River Elke in NW Ireland. Any visit here must include a self-guided tour at Donegal Castle, which was built in the 15th century and is adjacent to the town square, providing convenient access to shopping and dining options. While you’re there, pick up a jacket or cap made of Donegal Tweed, handwoven and unique due to its pattern and heathered effect. Sitting on the outskirts of town, the ruins of The Abbey of the Four Masters overlook the water where the River Elke flows into Donegal Bay. Glenveagh National Park is a lush, green oasis. A few miles north of town, admire the majestic cliffs of Sliabh Liag and take a comfortable walk around the scenic and serene Lough Eske. Galway sits on the west coast of Ireland where the River Corrib meets the Atlantic Ocean. Start your day in the town hub of Eyre Square, a public park adjacent to a collection of shops and pubs where traditional Irish folk music provides the soundtrack during the afternoons and evenings. The Galway Cathedral is one of the largest and most impressive buildings in the city. This Roman Catholic church features a mosaic of U.S. President John F. Kennedy. The Spanish Arch, located on the River Corrib, was built in 1584. Those seeking something a little spookier might be interested in the Lynch Memorial Window, where in 1493 legend has it the town mayor hung his son for murdering a visitor. GOLF: Ballybunion Old is carved from the earth, amid the dunes beside the ocean and features dramatic changes in elevation. It’s the most famous links in Ireland, in part because American professional Tom Watson, the five-time Open Champion, professed his love for the layout when he hoisted the Claret Jug in 1982. A natural, elemental design it is cut from the same cloth as Pebble Beach or St. Andrews, courses that needed only slight refinement by the hand of men. SIGHTSEEING: Foynes is a tiny village but a major port in County Limerick in midwest Ireland. While there are less than 1,000 residents, Foynes is home to the Flying Boat & Maritime Museum which features historical archives and interactive exhibits. Tour the only replica B314 Flying Boat in the world, enjoy a panoramic view in the reinstated control tower and learn about the movie stars and celebrities who spent time here in the 1930s and 1940s. Also discover the village’s connection to the U.S. Civil War and discover the story behind the origin of Irish Coffee - enjoying a taste for yourself, of course. Situated in a small valley south-east of Bantry Bay lies the town of Bantry. Originally a navigation of waterways rather than streets, in recent years Bantry has been redeveloped on a large scale into a cosmopolitan hub. With its central West Cork location, it is considered the main shopping and commercial centre in the region. The Town Square features a picturesque promenade and a mile-long footpath offers a glorious view that extends from the town. With its charming brightly coloured houses and streets, mountainous surrounds, and relics from monastic settlements scattered throughout the countryside, Bantry is a hub for tourists and walkers alike. GOLF: Perched atop a cliff in a dramatic portion of Ireland, the links at Old Head is one of the world’s most discussed courses as golfers appreciate not only its magnificent beauty but also the diverse strategic options in ever-changing winds. The par-5 No. 17, ‘Lighthouse’ requires golfers to challenge the rugged coastline - or play conservatively and deal with a blind approach. The home hole is a daunting dogleg left par-4 with trouble awaiting on both sides of the fairway. SIGHTSEEING: Located on Ireland’s southeast coast in County Cork, the quaint seaside town of Cobh (old Irish for cove) is known for its great maritime heritage and seafaring history. As Ireland’s only dedicated cruise terminal, Cobh was the departure point for 2.5 million of the six million Irish people that immigrated to North America between 1848 and 1950. It remains a popular port of call today for cruise liners from all over the world in part due to the fact that Cobh was the last port of call for RMS Titanic. Cobh has remained largely unchanged since that fateful day in 1912 with brightly colored houses along streets that climb to the top of the hill which is crowned by the imposing Cobh Cathedral, St. Coleman's Cathedral with its carillon of 47 bells. On the waterfront there is a statue of Annie Moore who was the first person admitted to the United States through the new immigration center at Ellis Island on January 1, 1892. Enjoy Cobh on your own or via Azamara Shore Excursions®. SIGHTSEEING: The Viking traders who founded Waterford in 914 were not the first to settle in this vicinity; Neolithic standing stones and megalithic tombs testify to much older cultures. A veritable march through the centuries continues with Norman forts, medieval abbeys, and numerous manor houses of 17th and 18th century vintage surrounded by primeval forests, and delightful gardens perfect for strolling. Enjoy Waterford on your own or via Azamara Shore Excursions®. Dartmouth is a town of 5,000 residents located on the western bank estuary of the River Dart. It features a beautiful harbor that’s dotted with terrific eateries and a steady stream of boats, docking and sailing. St. Saviour’s Church is known for its beautiful stained-glass windows and keeping sailors safe for centuries. The small gardens at Coleton Fishacre make for an easy, walking tour and the Tea Room there is a must visit afterward. This challenging traditional links course provides outstanding views over Howth and the Irish Sea. The first five holes away from the sea provide a gentle start, but then the course comes alive as the holes make their way through the dunes back towards the sea. The back nine provides a series of stunning links holes with deep bunkers with steep faces giving the course a traditional look while incorporating modern architectural techniques. Situated in the shadows of the Mourne mountains. A spectacular location and an outstanding links golf course. Royal County Down’s charm lies in the old fashioned flavor of both the terrain and the layout. A mix of rugged dunes, colored by a blend of purple heather and yellow flowering gorse combine to a dramatic effect on what is one of the toughest courses in the British Isles. Venue for the Walker Cup in 2007 and consistently ranked in the top 10 courses in the world. An outstanding course in a dramatic setting. Royal Portrush holds the distinction of being the only course in Ireland to have hosted the British Open, doing so in 1951, and the championship returned there in 2019. The Dunluce Course is as fine a links as you will find anywhere, with the 5th being a particularly memorable hole to a green hanging on the edge of a cliff. Consistently ranked in the top 20 of the world's best courses, nearly every legend of golf has accepted the challenge of Royal Portrush. Carved from the earth, amid the dunes beside the ocean, the Old Course at Ballybunion features dramatic changes in elevation. It’s the most famous links in Ireland, in part because American professional Tom Watson, the five-time Open Champion, professed his love for the layout when he hoisted the Claret Jug in 1982. A natural, elemental design it is cut from the same cloth as Pebble Beach or St. Andrews, courses that needed only slight refinement by the hand of men.